A bedroom is not a bedroom without a bed and not much of a bedroom without at least a few pieces of essential furniture – particularly a dresser and at least one nightstand. But even with all of the essentials in place, your bedroom might still be lacking that special something. That’s because for the most part, it’s the accessories that transform a functional but plain room into a cozy and attractive space that feels welcoming after a long day. And there are certain accessories that work so well in the bedroom, you can give your space a whole new look just by adding them to the mix. Here are the eight accessories that every bedroom needs. Every bedroom should have a colorful throw blanket to add a spark of colorful contrast. Keep it folded across the foot of your bed to warm your feet on chilly nights. Wrap it around your shoulders when you sit up in bed to watch TV. Or use it to stay cozy when curled up in your reading chair with your favorite magazine. Here’s another opportunity to add shots of color, pattern, and texture to your bedroom décor. Add a few toss pillows to your bed and instantly, your room looks better. The trick is to use no more than three pillows and choose colors or patterns that contrast with your bedding while tying in other accessories in the room. They might seem unnecessary and from a purely functional perspective, they are, but a pair of shams perched at the top of the bed adds unquestionable style to your room. If you really want to go all out, you’ll need four shams: two European shams against the headboard with two standard shams in front of them. You can match your shams to your comforter or use them for contrast. 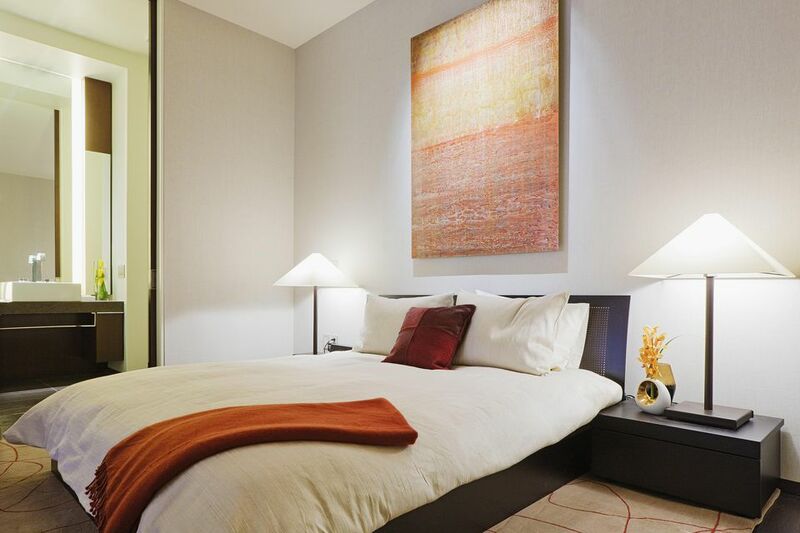 You should have several sources of light in your bedroom — a bedside lamp, a floor lamp, perhaps ceiling lighting. If all of those light sources are ho-hum, however, you’re missing a great chance to boost your bedroom’s appeal. Not every lamp or fixture needs to be a showstopper, but at least one should be something special. A small chandelier, a whimsical animal-figure bedside lamp, a gleaming chrome floor lamp with a sleek design — whatever your bedroom’s decorating style, there’s a lamp or fixture to complement it so make sure that at least one of your light sources makes an impact. Give your bedroom panache with something large and striking on the wall over your bed. While a group of smaller pieces might be attractive, it doesn’t carry the same punch as a single, strong accent piece. When considering your options, don’t limit yourself to framed paintings or prints. Other choices include quilts, ornate mirrors, architectural trim, wall decals, framed maps, enlarged photos or tapestries. As long as your choice is at least half the width of the bed, it’s big enough to balance the bedroom’s look. Don’t rule out an area rug just because your bedroom is carpeted. Rugs add another layer of texture to the room as well as color and pattern. When sizing an area rug for use under the bed, you’ll want at least two-thirds of the bed to be atop the rug, with a minimum of 18 inches showing on both sides and at the bottom of the mattress. That means you’ll need a 5x8 or 8x10 area rug, depending on the size of your bed. Other options are placing a smaller rug at the foot of the bed or along the side of the mattress. In either of these cases, choose a rug that fills the space to within a few inches of the nearest wall. Every bedroom needs a houseplant or two. They help purify the air, add a touch of living color and give a serene feel to the space. If your thumb is any color but green, stick with easy choices like Chinese evergreen, dracaena or pothos. The bedroom is the most personal space in a home. Think of visiting a friend’s house — you sit in the living room and probably don’t hesitate to enter the kitchen or bathroom, but the bedroom is often implicitly off-limits. Increase the sanctuary-like feeling by adding one or two personally meaningful items to the space. These might be as simple as framed photos of your favorite people or places; or something you made, collected or were given that has special meaning to you.